Hello, summer our old friend. Oh, how we missed you. With your sunny season comes cookouts, nights at the ballpark and of course, time in the pool! And oh pool, how we need you in this heat! Average temperatures for the summertime in our beloved New Orleans, Northshore, Baton Rouge and MS Gulf Coast areas hover around a sweltering 90°. 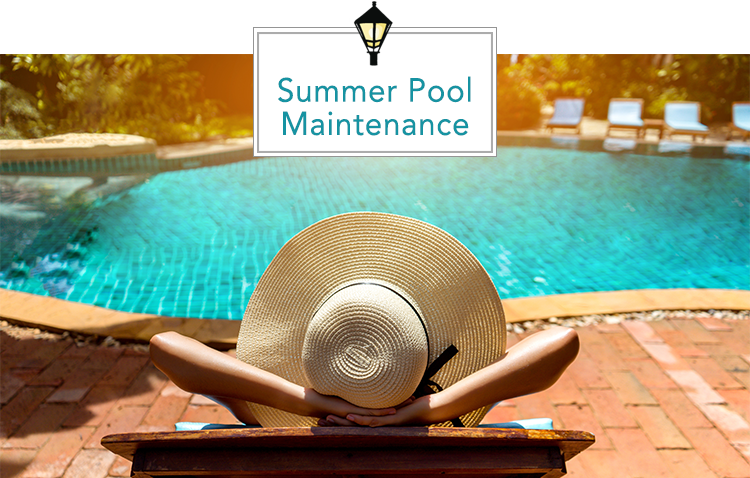 So yes, the pool is our cooling friend this time of year, and that means we need to do everything we can to make sure it’s in tip-top shape. Take a dive into these simple summer pool maintenance tips, and ensure you and your family can actually have fun in the sun! Like all things good for us, pool maintenance is best done when it becomes a habit. What does your daily list look like? Exercising, cleaning the house, taking some personal time? Add skimming the pool to your list of daily tasks, and your pool will thank you. Take it from me, skimming the pool for leaves, bugs, and dirt in the morning is actually a really peaceful, mindless task. When you’re done, make sure to check the filters and make sure they’re clean as well. Finally, keep an eye on your water levels; it should be halfway covering the opening of your skimmer. This will make sure that your pump is working efficiently. You’re probably not jazzed about tip #1 because, yes, it does take a bit of work and dedication. That’s why tip #2 is to get a helpful friend. We doubt your neighbor or bestie wants to come to help you clean; we’re talking about a pool vacuum! These little water robots can get to the floors of your pool and save you a ton of difficult scrubbing. Our family uses a Polaris brand. Trust me, it’s worth the investment! If we were ranking these tips in order of importance, this would easily be #1. If your chemicals aren’t in balance your pool will begin to look murky. Even worse, the pool will begin to irritate your eyes and skin, and even worse, become a breeding ground for bacteria. BUT, have no fear, maintaining your levels isn’t as scary as it sounds. Buy a testing kit, a simple way to test Chlorine, Bromine, pH, Acid Demand, and Total Alkalinity levels of your pool. Follow the instructions during a weekly check to ensure your water is completely balanced and ready for action! Shocking your pool is another task that sounds scary, but it’s really not. And, it can be quite necessary. For example, you know the way your pool looks after you throw the party of the Summer? Yep, that’s when you need a good shocking (essentially just adding a ton of chlorine at one time to kill all the bad bacteria). The goal is to do this step twice each season, and here’s how. Following these tips will make your life a lot easier, but as you probably already know, pools are a lot of work. Don’t be afraid to call in an expert. Sometimes, the smallest changes can make the biggest differences. And while you may pay more upfront for their professional services, you’ll more than make it up in the long run when your pool is clean and clear! Here’s to a splash-filled summer!